Supermarkets: anti environmental villains promoting mass production and creating excessive food miles? Or could supermarkets open the path to green and ethical products for the everyday consumer? It can't be denied that supermarkets offer around the clock choice and convenience for the consumer, but it all comes at an environmental cost, meaning that the supermarket often finds itself at the sharp end of criticism. On the other hand, the power of the supermarket giants makes it hard to ignore the possibilities these businesses have to play in our fight against climate change. In any case, it's certainly possible to shop at a supermarket with the environment in mind. In this article, we're giving you the tools to shop greener. 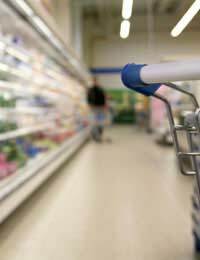 The popularity of supermarkets has much to do with the convenience of food, electrical products, clothes and more all under one roof. And this 'under one roof' sentiment can work in the favour of the environment too by minimising the number of trips - particularly by car - that we need to make in order to live our day-to-day lives. Write a list of what you need in order to reduce the risk of an unnecessary extra trip out, and make your supermarket run a weekly, rather than daily journey. The range of products on the average supermarket shelf has broadened massively in recent years, and most products include an ethical, greener choice - so vote with your feet and buy recycled, Fairtrade and organic goods. All of these products reduce the impact of climate change by promoting a greener agenda, including making the most of natural materials and lower carbon emissions. The more we buy these types of products rather than conventional ones, the more supermarkets will stock environmental products - and ultimately, the lower the prices will become. Gone are the days that shopping at a supermarket automatically means having to use a car to travel there. While many large superstores are in out of town settings, many local bus and train companies offer specific routes to cater for supermarket shoppers. If you do need to use a car, double up with a friend and share the journey, which isn't just better for the environment, but also some company for your trip! Alternatively, look into the possibility of shopping online, and cut out the journey to the shops altogether. Your goods will be delivered to your door, in a single van journey, at the same time as other local deliveries. According to DEFRA, the UK consumes a massive 13 billion plastic bags in the UK, which can take hundreds of years to decompose in a landfill site. Ensure that you're not using more bags than you need - bring used carrier bags, or reusable bags made from sustainable materials each time you come to the supermarket. Bringing your own bags is often rewarded with bonus green points as part of a supermarket's points scheme. Reusable bags are stronger and can even be trendier, as the craze for Anya Hindmarsh's 'I am not a plastic bag' reusable design demonstrated.